"Cossack to Mega Man! Cossack to Mega Man! Come in, Mega Man! "Protoman has gone wild! City Hall and the spaceport have been totally destroyed and the city's power grid is in shambles. I've never seen destruction on this scale before. "I know you're worried about Dr. Light, but your first duty is to free the city from the grip of Protoman's robots. I can modify your reactor to give the Mega Buster a little more power, but the rest is up to you. Dr. Light and I had been working on a special project, but it's not finished yet. Maybe if I can get it working, it might give you an edge. "Remember to watch your back, Mega Man. Protoman seems to have become more ruthless than we had thought possible. Good luck. --From the NES Mega Man 5 instruction manual. Play Mega Man 5 Now! Eight robots have been released into the world to cause chaos and havoc, and behind it all is..... Protoman!? 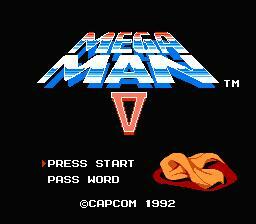 Dr. Light has been kidnapped, and the only clue left behind was the distinct yellow scarf worn so often by Protoman. Now Mega Man must once again run into battle to save the world and Dr. Light. Mega Man, however, is not alone on this quest. He is helped by his robot dog Rush and their new friend Dr. Cossack, who has created a new ally for Mega Man, a bird named Beat, who flies into enemies and causes damage. Can Mega Man save his creator and the world from his brother's clutches? We shall see. Mega Man 5 is the next installment of the classic series. Graphics have been improved, with a new design for the Mega Buster and a new intro screen for the enemy robots. The music quality has improved, but is for the most part similar to the classic music of the game series. Mega Man 5 is the next classic platform game to feature our wonderful robotic hero, Mega Man. Just like the others before it, Mega Man 5 features eight Robot Masters on their own stages. As usual, you can choose which one to play first. After defeating the robots, Mega Man can take their powers such as Wave Man's wave shot or Napalm Man's fire cannon, which can be selected in the menu. The evil robots are about the same size as our hero and have the same amount of life, but it is not advisable that you jump into battle without thinking. Each Robot has a weakness which must be worked out, the rock-paper-scissor technique does apply in this game. Also, each Robot Master has a pattern that he attacks with, which is not necessary to learn but it does help. The names of the robots are as follows: Gravity Man, Wave Man, Stone Man, Gyro Man, Star Man, Charge Man, Napalm Man, and Crystal Man. Fight your way through all eight stages, grabbing power-ups that boost your health and weapon energy, and collecting extra lives (hopefully faster than you lose them). You can also collect E-tanks that allow you to refill your life when you need. Finally you will reach Protoman's Castle. There you will face Protoman four times before you learn the truth. Along with Rush, your robotic dog who helps you jump higher and can turn into a submarine or a jet pack to help you along the way when needed, you are given a new friend, Beat, a small bird that launches itself into enemies to cause them damage. Before you can acquire Beat, you must first collect all the letters to spell M.E.G.A.M.A.N.V. So, therefore you can't use him until you get to Protoman's Castle. Good luck player, and lock and load!